Sharing their love and knowledge of Squamish Bald Eagles. 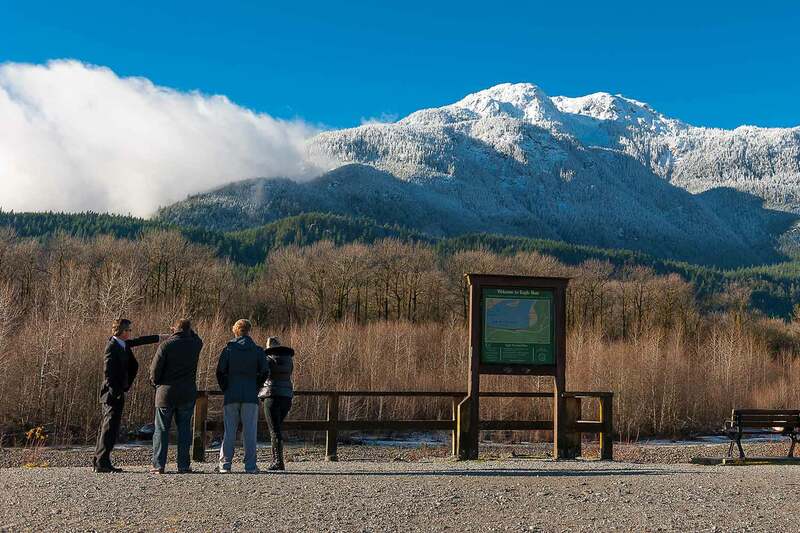 The Squamish Environment Society EagleWatch Interpretive Program is a volunteer-driven, community-based educational program that has been educating the public on Squamish's wintering bald eagle population and its importance since 1995. The priority of the program is to foster respect for all wildlife and the surrounding environment while spreading awareness of proper eagle viewing ethics and behaviours. EagleWatch volunteers are stationed at the Eagle Run viewing shelter in Brackendale every Saturday and Sunday from 10 am - 3 pm between November 10 and January 13, as well as during Christmas week. The EagleWatch Education and Outreach Program offers customized bald eagle presentations as well as field experiences for school and special interest groups on weekdays throughout the winter season. Book a special session by contacting eaglewatch [at] squamishenvironment.ca. There is no cost for these sessions, but donations to help cover costs are always welcome.